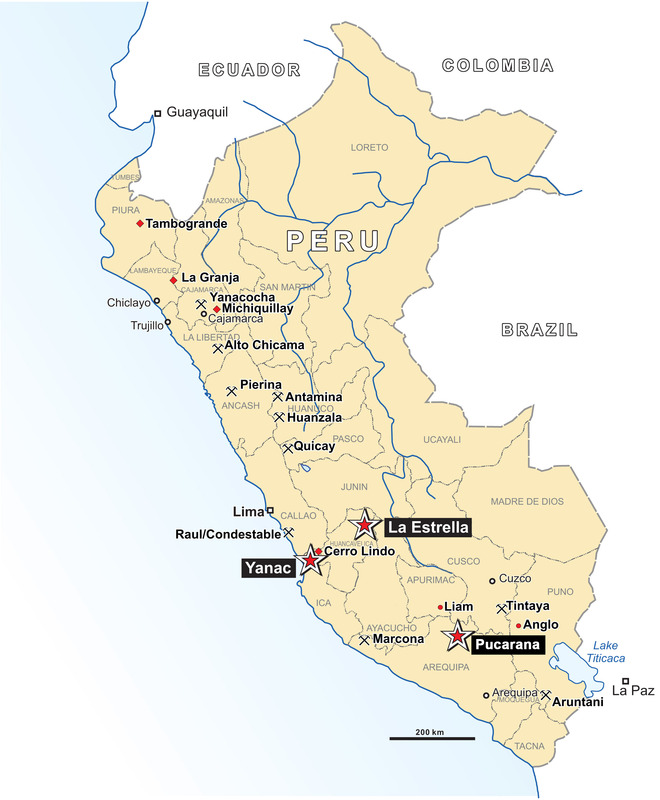 The Yanac Project is a drill-ready copper-molybdenum porphyry prospect in the Ica Department of southern Peru. The project is located approximately 60 km inland from the Pacific coast and 50 km from the nearest town of Chincha Alta. A newly constructed airport (Pisco International Airport) opened in 2016, 43 km south of Chincha Alta. A multipurpose port facility exists 78 km south of Chincha Alta. The project is a result of an exploration alliance with Cliffs Natural Resources. Cliffs spent more than $1.2 million in exploration to bring this prospect to the drill ready stage prior to an internal corporate decision at Cliffs to discontinue all exploration worldwide in 2014. In late 2015, Cliffs sold its 50% interest to a private company as part of a larger sale of research and development technologies and exploration properties. Alianza regained 100% ownership of the property in late 2016. Exploration has identified a 1.1 x 1.25 km area of alteration and porphyry style mineralization (pyrite-chalcopyrite-copper oxide-molybdenite) surrounded by a halo of quartz-pyrite veining. IP geophysics indicates a potentially larger mineralized body at depth. The Yanac prospect is a copper ± molybdenum porphyry occurrence located in the Andean southern porphyry mineralization trend. The hydrothermal system is associated with Upper Cretaceous fine diorite to quartz diorite stocks of the Coastal Batholith. The surface expression is a 1.1 km x 1.25 km area of alteration (chlorite, chlorite ~ epidote ± pyrite) with irregular silica clay ribs. Rock geochemistry is anomalous in copper (+ 600 ppm) and molybdenite (+ 10 ppm) over approximately 900 m x 900 m. Within this lies a 400 m x 400 m expression of porphyry-style mineralization with chlorite-epidote assemblages that also includes quartz stockwork (up to 10%) with magnetite and secondary biotite. Mineralization consists of chalcopyrite-pyrite (± CuOx) and molybdenite reflected in a 250 x 400 m area of >0.3% copper in rock samples. Adjacent to this is a second area of >0.3% copper in rocks in a copper-bearing, coarse white silica breccia adjacent to the porphyry mineralization. Numerous silica- clay ribs and sericitized areas surround the mineralization, including a halo of sheeted pyrite ± quartz veinlets. This distal-style (epidote-chlorite +/- magnetite and perhaps biotite) alteration in addition to geochemical pathfinder element distribution indicates the presence of an upper level porphyry system with high potential open at depth. This is corroborated by the high chargeability response (> 20 mV/V) that may reflect an upper level copper porphyry system with a sulfide cap where pyrite is dominate over chalcopyrite with the possibility of there being a change to a chalcopyrite dominant over pyrite mineralization at ±150 m depth. Cliffs laid out a twenty drill hole proposal to test this hypothesis in 2014 but due to the aforementioned issues at Cliffs, it was never undertaken. 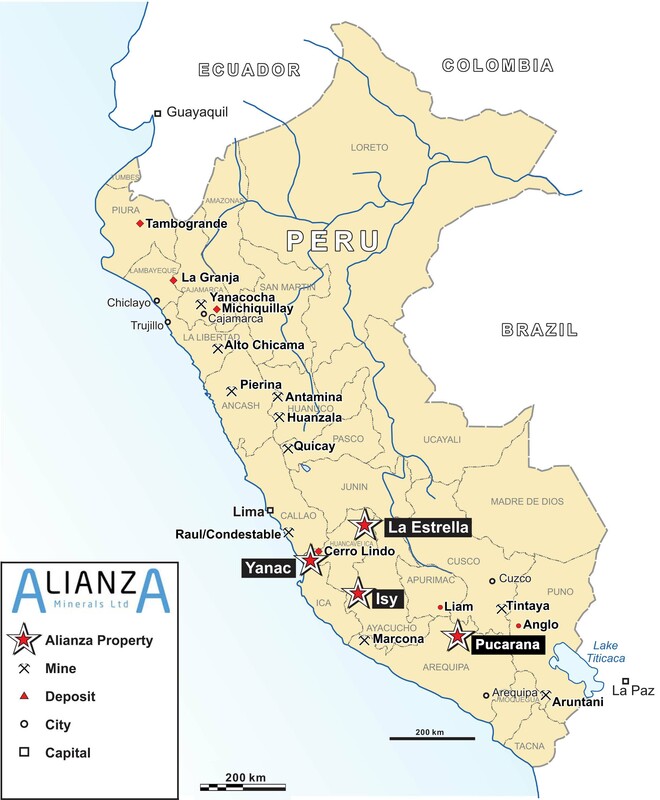 Alianza is actively seeking a partner to fund an initial drill test of the Yanac porphyry project. A multiphase, 20 hole program has been planned and budgeted with the ability to commence work in 2017.